Maintain a comfortable environment at your home or business with the installation of an energy-efficient air conditioning system or upgrade your current system. With our expert HVAC Technicians, not only do you save money with our affordable rates, but you also hired the best in the business. Whether you have an emergency at your residence or business, or need general plumbing repairs or replacement, Lakewood Mechanical, Inc. is available 24/7 to help you. Rely on our master plumbers to provide you with exceptional service and a quick response time to your emergency. Request a service from our plumbing and air conditioning Department in Pittsburgh, Pennsylvania, and expect quality results. Hours of Operation: Monday – Friday, 7 a.m. – 5 p.m. 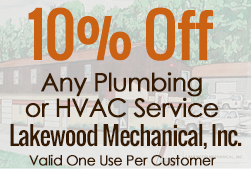 When your home or business is in need of plumbing, air conditioning installation, or heating repairs, choose the quality workmanship of Lakewood Mechanical, Inc., Our Company has over 150 years of combined experience in Plumbing, Heating & Cooling in the Tri-State Area. Our team provides superior and dependable service for your home or business. Find convenience in our speedy response with radio-dispatched trucks available 24/7 to answer your emergency calls. Pride in our work has always been the foundation of our company. Nearing four decades of experience, our one-man shop has grown to a full-service contracting company, saving you money with our competitive rates. We are licensed, bonded, and insured, as well as Registered Master Plumbers and gas line certified.